Lock in a great price for Hotel Torenhof – rated 9.1 by recent guests! Nicely situated in a green area near the city of Ghent. Spacious holiday home with comfortable beds. Great breakfast. The hotel is in a great location near Ghent. It is a quiet location, very relaxing. Breakfast was a treat, though the coffee was that American type. Lovely grounds and beautiful building. Staff friendly. Asked and received a quiet room, which was enormous, if only the WC was larger. An enormous breakfast with great choices and except service. The bed was new, so excellent to sleep. Nice building, quite surrounding. Large, spacious bedroom, we both appreciated two comfortable easy chairs in the bedroom, along with a well- appointed bathroom and excellent shower. Very picturesque grounds in a very peaceful setting close to a city environment and motorways. A good choice of breads were offered at breakfast. Extremely good restaurant - The Old Schoolhouse very close to hotel. The hotel is simply amazing. Great hosts, amazing breakfast and nice and quiet surroundings. They also were so accommodating for our dog and even had cookies for him! Would definitely come back if ever visiting Ghent or surroundings again! 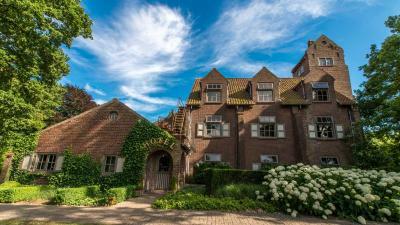 Located in Sint-Martens-Latem, just a 15-minute drive from Ghent, Hotel Torenhof is housed in the former house of the painter Albert Servaes. This small hotel enjoys a quiet location at the edge of a nature area and a terrace with landscape views. Meeting room facilities are available for a surcharge. All spacious rooms are decorated with elegant fabrics and furnishings. Each room offers free WiFi and a private bathroom. Each morning breakfast is served. Packed lunches are available for your day trips. You can rent a bicycle from Hotel Torenhof to explore the natural surroundings, which also have hiking routes. Brussels, Antwerp and the North Sea Beach are 31 mi from Hotel Torenhof. Flanders Expo is 4.3 mi away from the hotel. 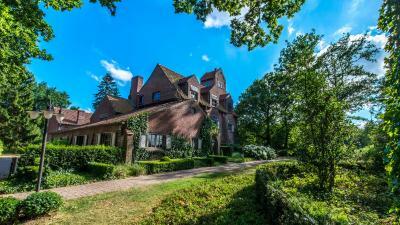 This property also has one of the top-rated locations in Sint-Martens-Latem! Guests are happier about it compared to other properties in the area. This property is also rated for the best value in Sint-Martens-Latem! Guests are getting more for their money when compared to other properties in this city. When would you like to stay at Hotel Torenhof? Please note that this room can only reached by stairs and not by elevator. This bungalow consists of a living room with a TV. It has an open-plan, fully equipped kitchen and a downstairs bedroom with en-suite shower bathroom. The second bedroom, also with an en-suite, is located upstairs. Two separate toilets are also available. House Rules Hotel Torenhof takes special requests – add in the next step! Hotel Torenhof accepts these cards and reserves the right to temporarily hold an amount prior to arrival. Nothing really to mention in this respect, I enjoyed every aspect of our stay. I am trying hard to think of something to add or change - well, maybe add some fresh vegetables or fruit to the breakfast. But that's so personal, I, for example, enjoy a tomato or a piece of cucumber with my sandwich in the morning, others might like a piece of fruit with their yoghurt. But frosty welcome. If you are arriving after 1pm on a Sunday make sure you are in contact in advance. Fantastic historical house and excellent breakfast. too gloomy, not enough hallway lighting. too old fashioned. A lovely building which had been the home of a famous artist. Excellent comfortable room. Lovely supper in the evening and a breakfast to set you up for the day. Quiet and peaceful. We stayed a second night to enjoy the surroundings.